Bringing Chinese martial arts to the world stage, Bruce Lee (李小龍) pioneered the trend of kung fu films in the 1970s. 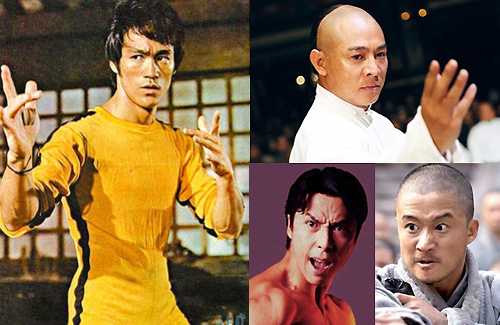 Following Bruce’s death, kung fu continued to thrive in pop culture throughout the 1990s and the 2000s, with Jackie Chan ( 成龍), Jet Li (李連杰), Donnie Yen (甄子丹) dominating the genre. This period was practically the golden age of kung fu films, as these stars crossed borders and became international superstars. Each of these three stars also managed to develop their individual, unique styles over the years. Jackie is known for mixing his martial arts scenes with humor, a formula which he carried in his Hollywood career. As for Jet, he is known for his technical excellence, having won the national martial arts competition in China for five consecutive years. Starring as the folk hero Wong Fei Hung in a series of films, Jet’s beautifully orchestrated fight scenes sparked off a martial arts craze. Donnie followed in the footsteps of Jackie and Jet, and popularized the mixed martial arts style. His iconic role as Ip Man (葉問) allowed his popularity to rise exponentially internationally. Currently, Donnie commands $10 million USD for an appearance in a Hollywood film. Following Jackie, Jet and Donnie, the other two prominent martial arts stars are Vincent Zhao (趙文卓), and Wu Jing (吳京). Having achieved some degree of success in the Chinese market, Vincent is now planning to break into Hollywood and has already embarked on training in the United States. Despite being Jet’s junior at the same martial arts school, Wu Jing’s career started off promising, but has become stagnant. Wu Jing acknowledged the fact and hopes to have a career breakthrough with his new 3D film,Wolf Warriors <戰狼>. Many worry that Chinese martial arts is slowly losing its influence in pop culture, with few successors in sight. Wu Jing once expressed that today’s martial arts stars lack training and require more time and experience to truly mature. Martial arts continue to be featured in the contemporary Chinese entertainment market, with popular films such as Rise of the Legend <黃飛鴻之英雄有夢>, which stars Eddie Peng (彭于晏). While the new generation of “martial arts” stars have a less extensive kung fu background compared to those of yesteryear, they train hard to prepare for their roles. Furthermore, today’s film audiences no longer prefer films that solely emphasize the martial arts craft and have a preference for films that contain both thrilling action scenes and special effects. For instance, in his more recent films, Jackie often embeds humor in his action scenes. There is perhaps no need for today’s martial arts stars to focus too much on the technical craft, as long as they personify the spirit behind martial arts. is there an article on the actresses? Vincent Zhao a rising star? After that fiasco with Beijing Starlet Films a few years back, I don’t see how he’s making it big anytime soon. Like so many action talents in the business, craft and niche comes first in order to be an international name. Zhao hasn’t found that yet. Same goes with Wu Jing — who has a bigger chance than Zhao though, Xing Yu, Fan Siu-Wong, Philip Ng etc. It takes time. i think there are still martial arts artist in hk but it is hard to find one that are the caliber of jacky chan, jet li or donnie yen. bruce lee is unique,such legend comes once in a thousend years. its sad if there are no decent successors anymore. Time’s changed…the younger generations are used to good and easy life. It’s not a simple profession to master the kungfu skills as it requires determination, patience and true passion. The new generation only craves for short cuts, therefore most of today’s stars are short lived…the shine only for a short moment and they vanished…it’s sad…no more superstars like those days…it happens everywhere. The evolution of kungfu stars from actually knowing kungfu to not knowing a thing about kungfu :p? I’d be surprised that Donnie yen could command $10m USD in a Hollywood film. His never led in one to my knowledge. Donnie has “Crouching Tiger, Hidden Dragon 2” coming up, which may be his most lucrative Hollywood project to date. He’s also going to begin production on NOODLE MAN in July. Crouching Tigers Hidden Dragon is not a Hollywood project. It will be directed by a HK guy and produced jointly by some Mainland/HK outfit. There is no involvement from anyone associated with the Ang Lee classic. The Weinstein Company, who initially announced the sequel, is also involved in the production. not true,its a american-chinese co production and directed by yung wo ping,he was the martial art choreographer in the first part,also this part. The Weinsteins will be involved in distribution, not production. lol,search wiki and you will see it is produced by harvey weinstein and david thwaites.the weinstein company are also listed in the production list. btw michelle yeoh was in the first cthd and this one. Going from good kung fu to cutting corners with camera angles/takes. Thumbs up for Eddie Peng. He is a really dedicated actor. Hate all you want but Chan will always be known as an innovator in martial arts films. His body of work from the late 1970s to mid 1990s speaks volumes. Eddie Peng? He used wirework and stunt doubles as WFH. He’s fooling no one lol. agree with dook,eddie peng is a fake martial artist.jacky chan if not talking about his fatherhood but just look at him as an martial art star,you can only say that he a legend. Why did no one mention Andy On? He’s cute, fit and can fight well too. But his acting needs improvement though. It’s sad to see real ku fung dies in film. That was a big factor that made Asian films so dif and unique than US. Now it’s all cgi, angle, and stun doubles. Any on can be “martial arts master” now aday…. You may not intend to offend some fans here but you intended to compare, which is not how it should be done. Donnie was put in the same company as Bruce Lee because he has had international recognition himself. Bruce Lee was the first Chinese/Asian action stars, so of course there were successors that followed suit after his death. If Donnie is not worth mentioning then you might as well not do the same with Jackie Chan and Jet Li. Donnie Yen has international recognition? Same level as Bruce lee, Jackie Chan, and Jet Li? lol…i guess with the inter web these days you are right…sorry…still chuckling over your valued insights….hahaha…Using your logic should we put Shaq in the same company too since he has made martial art type action film and is “internationally recognized”? Some of Donnie Yen’s recent films have been shown in theaters around the world (including) such as the IP MAN films, 14 BLADES, LEGEND OF THE FIST, WU XIA, SPECIAL ID. And MONKEY KING as well as KUNG FU JUNGLE are scheduled to be shown in the US. Not to mentioned that Donnie wrapped CROUCHING TIGER HIDDEN DRAGON 2 and will shoot NOODLE MAN in summer. What’s there to chuckle about? And what same level are you talking about? Bruce Lee, Jackie Chan and Jet Li made it globally in their own ways so how they got famous has nothing to do with being on the same level. Some of Donnie Yen’s recent films have been shown in theaters around the world (including the US) such as the IP MAN films, 14 BLADES, LEGEND OF THE FIST, WU XIA, SPECIAL ID. And MONKEY KING as well as KUNG FU JUNGLE are scheduled to be shown in the US. Not to mentioned that Donnie wrapped CROUCHING TIGER HIDDEN DRAGON 2 and will shoot NOODLE MAN in summer. What’s there to chuckle about? And what same level are you talking about? Bruce Lee, Jackie Chan and Jet Li made it globally in their own ways so how they got famous has nothing to do with being on the same level. Just to make it clear to you: The point of the article is that it includes important people that has contributed to Hong Kong martial arts films INDIVIDUALLY, which in turn have made it everywhere in the world and given those people international recognition and hype for producers/directors to take notice. I don’t see how it’s offensive that Donnie is being included. He brought new life in Hong Kong martial arts films during mid 2000s and has since gone on getting bigger and better in his OWN right. That doesn’t mean that people are being put in the “same level” as Bruce Lee.